The Dickinson College Commentaries has been bringing new life to ancient languages for the last eight years, and now the cutting-edge digital humanities resource is giving Latin and Greek new life by offering resources for translation into Arabic. A new model of textual commentary for readers of Greek and Latin texts, the Dickinson College Commentaries uses digital tools to enhance texts with explanatory notes, vocabulary, and graphic, video, and audio elements, including a core vocabulary of the most common words in Greek and Latin. All commentaries and notes submitted by the community are peer-reviewed and citable as scholarly resources, and they are created with the assistance of an extensive pool of contributors: teachers, students, editors and more. 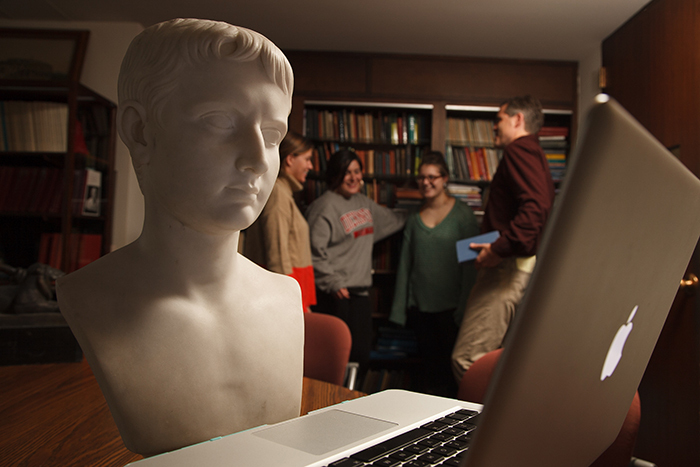 The project began in 2011, when a team of Dickinson students led by Asbury J. Clarke Professor of Classical Studies Christopher Francese provided digital commentaries for Julius Caesar’s Gallic War and Sulpicius Severus’ Life of St. Martin. Since then, the online resource for teachers and students has grown to include materials in Portuguese, Chinese, Polish and more. Recently, the site expanded to include translations from core vocabularies like Latin and ancient Greek to modern standard Arabic. While the larger core vocabulary project has been a very important resource for students, by students, the addition of Arabic commentaries will benefit scholars of Arabic-speaking countries. Learn about the Dickinson College Commentaries and its efforts to provide resources in Chinese, and discover more digital humanities tools at Dickinson.